I hate playing FCS schools. ...playing FCS schools is a waste of time and money. It's just not worth it. Unless you win by 50 points, and your starters only play one series, people are not going to be satisfied. 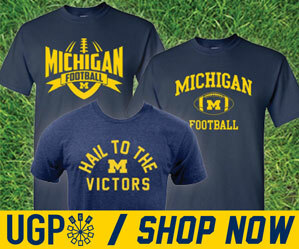 If you struggle at all, like Michigan did, fans will see nothing but doom. And after listening to WTKA on the drive home after the game, that's exactly what happened. And if by chance you should lose, and Michigan fans know that awful feeling...the world, literally, comes to an end. It's a useless game that's almost impossible to feel good about. It's not worth the effort or risk to injury. I'm sure to UMass its the super bowl. But to Michigan, it's a glorified practice...and early on, it showed. Let's not forget that UMass, ranked #16 in the top-25 FCS poll, has a decent offense. They committed to the run from start, and it worked well for them. John Griffin (17 carries, 96 yds) and Jonathan Hernandez (26 carries, 114 yds, 2 TDs) are two very good running backs. Both have speed and breakaway ability. And that was on display often on Saturday as Michigan defenders had a very tough time tackling these two backs. But I don't know what was more apparent...Michigan's lack of tackling ability, or just playing out of position...or both. For the first time this year we lost containment to the outside on multiple occasions. And runs up the middle were typically broke wide open for the Minutemen. The UMass O-line is very big, but they shouldn't have been able to open up holes like that. And Jonas Mouton and Obi Ezeh were constantly shooting the wrong gaps. "We were terrible on defense," Roh said. "We just didn't look like we were prepared to play and we didn't make adjustments during the game. "I promise you'll not see another game like that from us again." Michigan played the whole game, at least as far as I could see, in a pretty very soft zone. CB James Rogers was picked on all day. And while he didn't give up the big play, he gave up multiple small ones. UMass QB Kyle Havens went 22/29, 222 yds, 2 TDs and 1 INT. Clearly the zone was effective at not giving up the homerun like we did twice against Notre Dame last week, but UMass's ability to run opened up the pass. The running game coupled with a nice play-action pass worked well for UMass. I give them a lot of credit for performing this flawlessly. Yet, somehow...I do still think that our defense is better than it was in 2009...it has to be, right? But this game is clearly a step in the wrong direction. At times we looked confused, uninspired and flat out bad. At other times we looked okay. I think it really just boils down to not coming out prepared and ready to play. I do think this defense can be better, and will need to be better as the season plays out. Hopefully this was a huge wake-up call for the Michigan defense. We will find out at 12:00 this Saturday at the Big House. It's becoming more clear to me, that Rich Rodriguez's future at Michigan hinges on the play of this defense. He must get things corrected soon if he wants to stick around. The offense looked very good. We started the game a little flat, like the defense, but when UMass started pouring it on going up 17-7 in the 2nd quarter, this offense responded well, scoring 14 points in the last two minutes before half to take the 21-17 lead. We've been spoiled by two weeks of amazing Denard-ment. So anything less than 500 yards of offense was sure to be a let down, but he still looked good, and he made plays when he had to. He ended the day 10/14, 241 yds, 2 TDs and 1 INT. He also carried the ball 17 times for 104 yds and 1 score. One of the best things about Saturday was that Denard was not the leading rusher. Michael Shaw had a career day carrying the ball 12 times for 126 yds and scoring 3 times. Darryl Stonum stepped up as well with 3 catches for 121 yards and 2 TDs...and amazing 40.3 yds per catch. I think the game plan was probably to get some backups some playing time, but since UMass kept it close in the 2nd half, not many backups got into the game. I did notice freshman offensive lineman #77 Taylor Lewan got some time at left tackle in the 2nd half...and looked outstanding. All in all, you can take away from this game what you want. We really don't know if what we saw on defense was a blip on the radar, or an honest-to-goodness digression from weeks 1 and 2. BGSU comes calling this week after putting 44 up against Marshall in their home opener. This is going to be BGSU's super bowl, and they see a vulnerable Michigan defense, so they will come out inspired and ready to "shock the world" just like UMass did. I will reserve judgment until I see how our defense responds this weekend. But one thing is for sure...we have a lot of work to do, and BGSU is not going to be a pushover. Neither Brandan Gibbons nor Seth Broekhuizen have made a clear case for the placekicking duties. 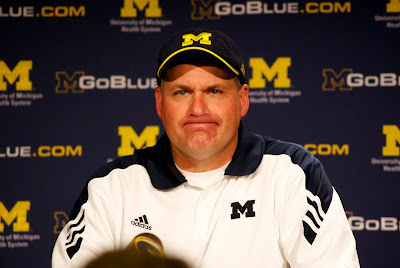 Rich Rodriguez address this in his post-game presser, saying that ANY student currently enrolled at the University of Michigan in good academic standing that has the ability to kick a football, will have the full attention of the Michigan coaching staff. All of the reporters and camermen in the room burst out laughing...Rodriguez looked down, smiled, nervously. I don't think he was kidding. Kickoffs have been a little better since the start of the season. Gibbons seems to be getting the ball to around the 10-yardline. A far cry from Zolton last year booming kicks into the endzone. Will Hagerup is starting to punt the ball a little better. But, again, BIG shoes to fill left behind by the Space Emperor who is now booming punts for the New England Patriots. I'm sorry, but what have you seen this season that would make you think that this defense is any different from last year's? Just compare statistics through the first 3 games in 2009 and 2010, and the numbers are very similar. UConn was manhandled by Temple, ND isn't any better in 2010, and UMass isn't a top-10 FCS team, like Appalachian State was. UM should still start the season 5-0, but it is going to be an ugly road later on if this defense doesn't improve. Denard Robinson isn't going to account for 500 yards against defenses like Ohio State, Iowa, Wisconsin, and Penn State, so the defense is going to have to tighten up.